Watermans’ Friday Night Live – Cabaret Time! Brentford in West London may seem a bit off the beaten track for some, but the Watermans Art Centre is ideally situated – just a stone’s throw from Kew Gardens, right on the banks of River Thames, with a wonderful view into the bargain. Parking is easy, or there are plenty of buses; mine stopped conveniently right outside. On Friday nights ‘Soho Goes West’, when Watermans offers not just great entertainment but also a buffet-style curry night, and the obligatory bar. When we arrived the atmosphere was really bustling – and with those fabulous aromatic smells filling the air I rather regretted I had already eaten. The art centre has an extensive entertainment program for all ages, including exhibitions, films, theatre, contemporary dance, a book festival, music and children’s activities; but I had come to kick-off my weekend with ‘Friday Night Live’, an evening of cabaret with award-winning musical character comedy Roulston & Young: ‘Je Regrette!’ This show was a smash hit at the Edinburgh Fringe, winning The Stage Award and an Argus Angel Award – and it was named as one of Time Out’s Top-Ten Cabaret Acts of the year. Je Regrette! is written and performed by seasoned entertainers Sarah-Louise Young and Michael Roulston. The show opens with the highly accomplished and talented piano player, composer and musical collaborator, Michael Roulston. Here he is playing a browbeaten and subservient pianist who accompanies French singer La Poule Plombée at her gigs, reluctantly leaving behind his family under her oppressive and uncompromising instructions. 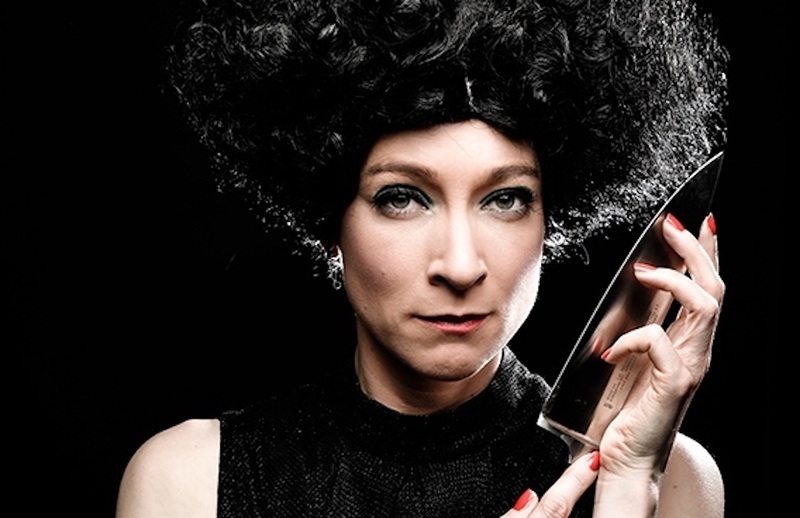 Sarah-Louise Young plays La Poule Plombée, the ageing, second-rate chanteuse, a diva plagued by jealousy and consumed with feelings of unrequited love. Her dramatic entrance in a long ‘little black dress’, wild hair, heavy makeup (think Norma Desmond meets Joan Crawford) – with a large glistening dagger in hand – sets the scene for the evening. Dare you take a front row seat? The witty duo co-wrote and expertly delivered a full score of ten smart, sassy and artful songs. 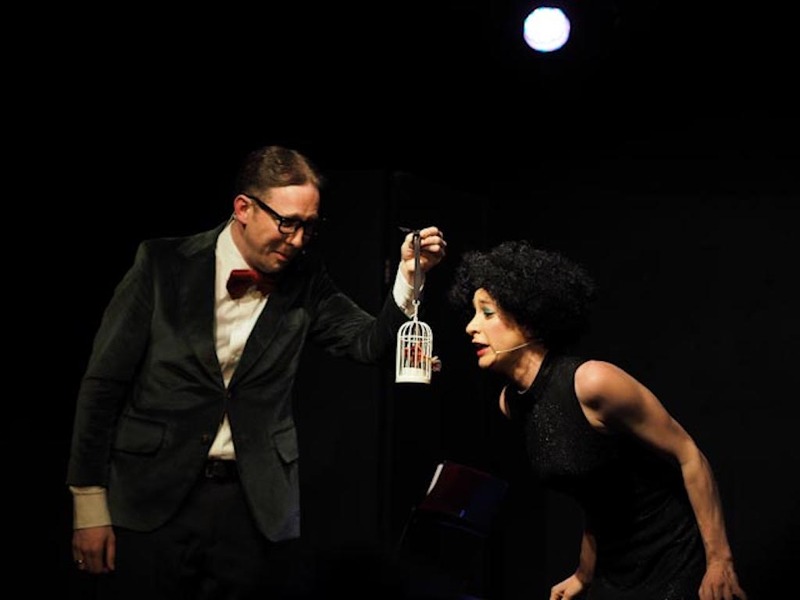 Sarah-Louise’s strong, rich voice is a total pleasure, but real joy lies in the couples’ comic ability to tell La Poule Plombée’s vie tragique, which we were told translates as ‘The Frumpy Pigeon’s tragic life’…You get the picture! This bittersweet character-led comedy weaves a dark tale of love and loss, in which La Poule cleverly embroils the audience …and not without a little bit of participation, you have been warned! Young’s French pronunciation didn’t falter throughout the show; in fact, my friend was initially convinced she was the real thing. She embodies wonderfully that notorious, stereotypical French contempt for ‘ze Engleesh’…who obviously don’t know how to eat, drink, dress – or undress…do we?! This is pitch-perfect, seductive cabaret which hands out equal measures of adoration and disdain towards the audience…….and don’t we lap it up! Ultimately though it is La Poule Plombée’s funny, tragic story, told in song, which wins over the crowd. A great evening in Brentford……and there’s plenty more to come…. Dusty Limits & Michael Roulston: Heaven and Hell (and Highgate) – Fri 8 Feb, 8.30pm. 75min. 18+. Aida and The Divine Comedy should attend. Jantti & Venna: Yabluchkov Candle – Fri 1 March, 8.30pm. 60min. 7+. £15. Fri 8 March, 8.30pm. 90min. £10. 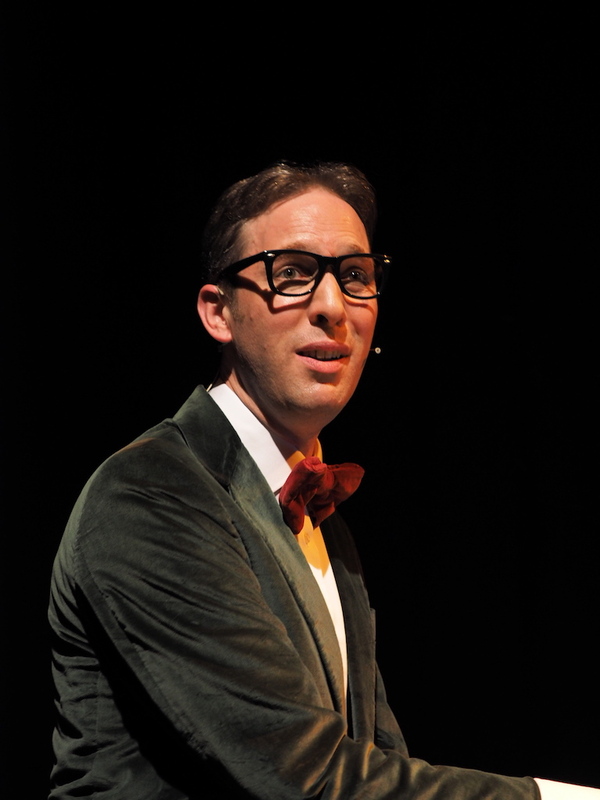 PAULUS: Beta – Fri 6 April, 8.30pm. 18+. £15.